Wintertime is approaching fast, and with colder weather comes a new set of inspections and maintenance that need to be done. From winterizing vehicles to salting roads and shoveling snow, MicroMain has the solution to your seasonal maintenance needs. 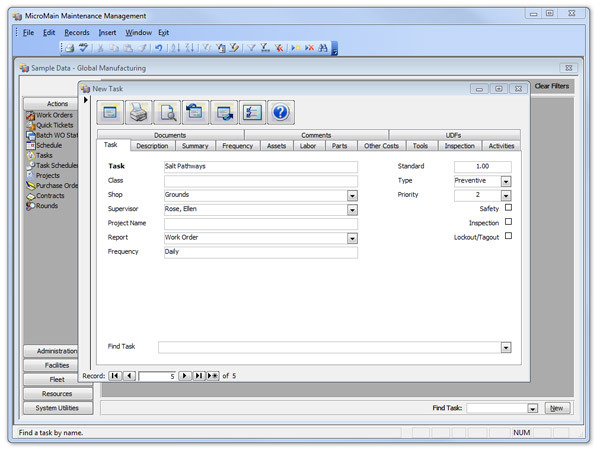 Maintenance Management, our award-winning CMMS software makes setting up these PMs easy. Simply click on “Task” inside Maintenance Management to enter the task that needs to be done. In this example, salting a pathway. Then select “Frequency” to set how often the task needs to be completed. At the bottom, select the dates which it needs to be completed. Now your PM is set to become a work order and and your pathways will be salted! For more information about Maintenance Management and how it can simplify your preventive maintenance and work orders, contact a MicroMain expert!